Leaders from 21 Asia-Pacific nations sought common ground Sunday after an unusually sharp exchange of words between the group’s two most powerful members, the United States and China. Wrapping up a two-day summit here, leaders will strive to craft a statement on the uncontroversial parts of their agenda — pushing for deeper regional economic integration. But the annual gathering has been overshadowed by speeches on Saturday from Chinese President Xi Jinping and US Vice President Mike Pence which appeared to represent competing bids for regional leadership. Pence warned smaller countries not to be seduced by China’s massive Belt- and-Road infrastructure programme, which sees Beijing offer loans to poorer countries for construction and development projects. The “opaque” loans come with strings attached and build up “staggering debt” for poorer countries, Pence charged, mocking the initiative as offering a “constricting belt” and a “one-way road”. He urged nations to stick with the United States, which doesn’t “drown our partners in a sea of debt” or “coerce, corrupt or compromise your independence”. In a speech to business leaders just minutes before Pence, Xi insisted the initiative was not a “trap” and there was no “hidden agenda” — amid criticism that it amounts to “chequebook diplomacy” in the region. And Xi lashed out at “America First” trade protectionism, saying it was a “short-sighted approach” that was “doomed to failure”. But Xi and Pence, both resplendent in shiny red patterned shirts provided by the Pacific island did have a brief tete-a-tete Saturday night at the leaders’ gala dinner. 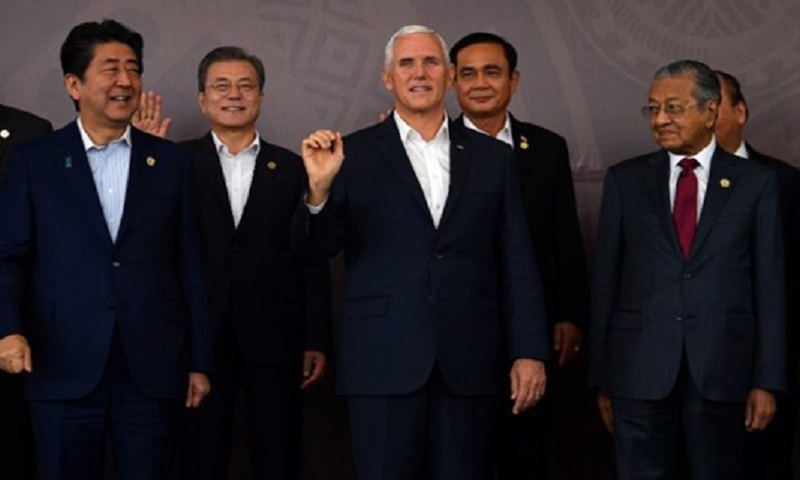 However, some voiced concern about the growing rivalry for influence in the region amid fears that a trade war between the two rivals could cripple the Pacific Rim economy. “Business leaders do not want to speak out, but behind the scenes here, they are talking over dinner saying ‘how has this happened’?” said Denis O’Brien, the billionaire chairman of Digicel. “It’s a very forced situation, one country is trying to force all the other countries to change tariffs agreed over years,” O’Brien told AFP. Trump — and Russian President Vladimir Putin — both decided to skip the gathering, leaving the spotlight on Xi who arrived two days early to open a Chinese-funded school and road in Papua New Guinea’s dirt-poor capital Port Moresby. Xi has been the star of the show, front and centre at the official photos whereas Pence has kept a lower profile, only deciding at the last minute to stay in Port Moresby overnight — shelving original plans to fly in and out from Cairns in Australia.